Tucked away on an inconspicuous street in a quiet north central Phoenix neighborhood lies an equally inconspicuous building—at least from the outside. But once you walk through the gates onto the tranquil campus of Huger Mercy Living Center, you know you’re someplace special. Operated by St. Joseph’s Hospital, Huger is an assisted- living facility for people with dementia. 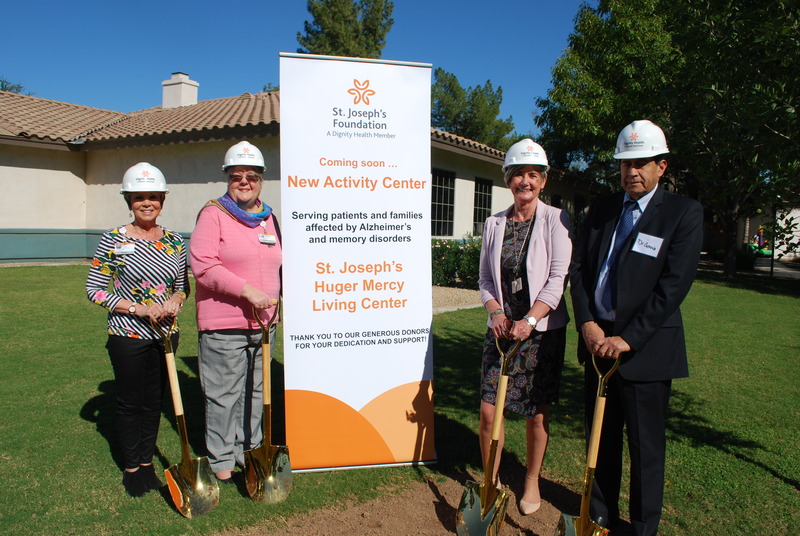 The grassy five- acre campus near the I-17 freeway was established nearly 20 years ago due in part to the generosity of the late Dr. Raymond Huger, a St. Joseph’s psychiatrist whose wife had Alzheimer’s disease. He envisioned a facility where residents could remain active, while being treated with dignity and respect. Today, that vision is a reality for the 48 residents who call Huger home; many will live their final days here. Every detail at Huger is carefully crafted to accommodate the special needs of those with dementia, a progressive loss of brain function that can be caused by a multitude of diseases, including Alzheimer’s disease and stroke. There are four identical cottages on campus, each housing 12 residents grouped together based on their activity and functional level. 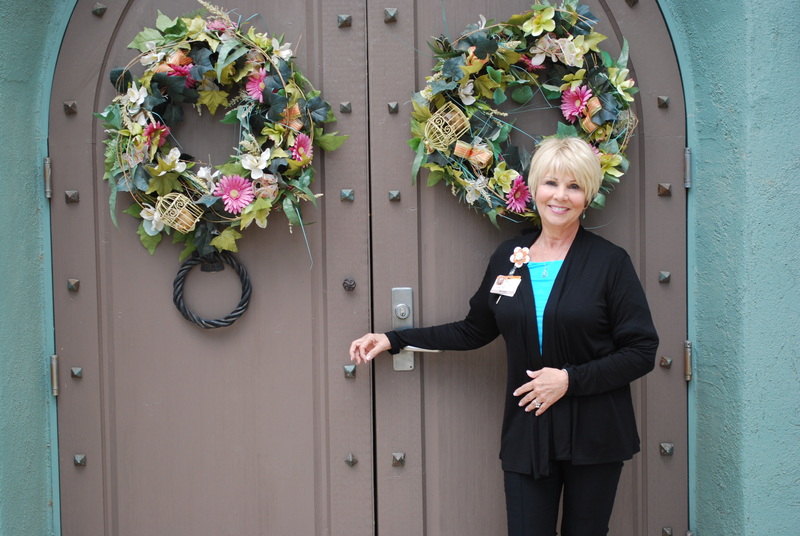 The residents receive 24-hour care from a staff of 30 certified nurse assistants and a full-time licensed practical nurse. Medical Director Robert Garcia, MD, and Geriatric Nurse Practitioner Marianne McCarthy, PhD, GNP, oversee the medical care. The campus also features a full-time chef. Huger adheres to a social, activity-based model, in which residents are encouraged to interact through a variety of activities. On any given day, you’ll find residents involved in anything from music and art to pet therapy. There are theme weeks and monthly outings, as well as holiday dinners and community celebrations, like the annual Fall Festival with students from nearby Orangewood Elementary School. This socialization not only helps with cognition, it also wards off the isolation that is common with dementia as one becomes less familiar with his or her surroundings. The activities are also beneficial to family members, who are encouraged to spend time on campus. Leslie Siegel and her brother spent the summer of 2009 searching for the perfect home for their mother. They looked at more than 70 facilities—Huger was their last stop. Her mother had always been a giver, Siegel says, and she could tell right away that Huger embodied that spirit of giving. “The feeling you get when you walk on campus is a climate of acceptance, love and caring for everyone—from the family members to the mailman,” says Siegel. Sandy Brophy’s mother and mother-in-law both lived at Huger; for a brief period, the women were residents at the same time. And while Brophy was always impressed by the care the women received, she was even more impressed with how that care extended to the family. This isn’t a coincidence, says Director Lisa O’Toole. Huger’s staff training program was recognized as a Best Practice by the Arizona Alzheimer’s Task Force, and employee turnover rates are well below the industry average. Recent family satisfaction scores were in the 96th percentile. Back in the day, Siegel’s mother was a singer. Today, the family delights in watching her come to life at Huger events such as Jazz in the Park. Other families have watched in awe as their loved ones developed new skills, like painting. “The activity-based model allows our residents to explore things they haven’t tried before, which is important because you never know what is going to appear as the disease progresses,” says O’Toole. The only challenge is a lack of dedicated space for hosting such activities. While Huger has a beautiful chapel for select events, there is not a central area where residents can gather for classes and other events. St. Joseph’s is exploring the addition of an activity center on the Huger campus. Regardless, Huger’s staff will continue to carry out the wishes of their founder, making a difficult journey more dignified for all involved. You can make a difference in the lives of patients suffering with dementia as well as their family members! Your gift will allow Huger Mercy to build a new activity center to expand and provide comfort and care to more patients suffering with Alzheimer's or dementia, as well as give their family members reprieve.